Another day another American craft beer brewed up by Cigar City Brewing. The flavor of the day: Tocobaga Red Ale. Tocobaga, easily noticed by it’s name, is an American Amber Ale. If you have followed Sips for any amount of time you should be able to recall that this is one of my least favorite styles: possibly an armpit style ;). Tocobaga completely blew me away and threw my perception of this style out the door for at least one beer. Tocobaga smells more like an American IPA than some American IPAs. Citrus hops abound for the nose and mouth to appreciate. Apricot, mango, and orange are all big here, well balanced, and blended. Caramel malt along with some very slight roasted malt come through (roasted especially as it warms). Definitely a great interpretation of the style. Enjoy! Useless Fact: During the French revolution, a magistrate named Jean Baptiste Carrier, commissioner of the National Convention at Nantes, dispatched a number of boatloads of political prisoners into the Loire River. When the boat was in mid-stream he ordered a trap door in the bottom of the boat opened, sending an entire group of prisoners to their death. From his merciless methods of extermination the word noyade, meaning “mass drownings,” was coined. When I picked up a bottle of Vuja De by Cigar City Brewing last week on vacation I had no idea of what I was in for. It could of been any style on the horizon as I would have purchased because I just wanted to try a bottle. When I looked it up on the internet and noticed that the beer was an American Wild Ale I was excited. It was hot and humid yesterday in Chciagoland and I just finished up almost three hours of work in the yard. Needless to say I was sweaty, smelly, and damn thirsty. So a sour seemed like it would allow me to relax and cool off. Vuja De is definitely a complex beer. The bottle mentions many added ingredients that I couldn’t make out. I did find cherries, currants, lemon, apple, sweet, white grapes, tartness, barn yard/earthy, and a boat load that I can’t even put into the words. Some might say this beer is too busy but I think the layers make the beer interesting and give the senses a chance to pick up more with each quaff. I really liked this beer and threw back the 10% 750 in less than an hour. Needless to say grilling out was fun. After having the bottle of Vuja De, I wish I would have purchased at least two bottles. I believe this beer will age nicely in your cellar. Enjoy! Useless Fact: When the volcano Krakatoa erupted in the Dutch East indies in 1883, the sound was heard in Bangkok, 3,000 miles away. At Batavia, 100 miles away, the sky was so darkened that people had to light their lamps during the day. The fine particles ejected by the blast covered almost every part of the world, and for the next two years a thin haze of these particles could be seen in the sky each night as far away as London. The family vacation went by like a blur as they all do. I had the chance to visit multiple craft breweries and have a few fine American craft beers but not the time to keep up with the blog. Hopefully will have this finished between today and tomorrow. Beer number 218 comes from my tour at Cigar City Brewing: Puppy’s Breath Porter. One of several beers I had on tap before, during, and after the tour but the only one I hadn’t had before. The spotlight of the beer in both the aroma and taste was roasted malt. It actually was the main ingredient that came through period. 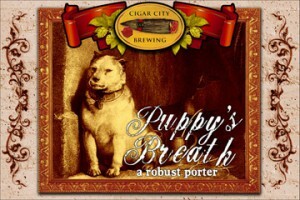 I thought Puppy’s Breath needed a bit more complexity, as Cigar City beers usually do. I would have it again but other offerings would find my glass first. Enjoy! Useless Fact: Japanese farmers, after removing the hulls from their rice crop and sorting out the white kernels, take the hulls from the leftover rice, mix them into a kind of paste, mold the substance into brick-shaped blocks, and build houses with them. Such buildings are known in Japan as “houses of rice skin”. I say this over and over again that it is good practice to go back and revisit old tastings of American craft beer. There are so many factors that affect your ability to appreciate the beer that at any one time you never know how you will perceive a beer. Giving a beer a second or more chance is important to seeing if your review is consistent with past thoughts. This is my third go around for Jai Ali IPA – Humidor Series by Cigar City Brewing with the beer agreeing with me more and more at each turn. This IPA is aged on cedar, which comes out nicely on the nose. Hops are woody, spicey, and citrus, with each having their time playing a tune on your senses. At one time, I would have said that Cigar City beers were lacking. I am going on a tour at the brewery tomorrow and have already purchased several bombers of beer. Looking forward to a beer or three on tap at the tour tomorrow. Darn tasty. Enjoy! Useless Fact: In 1940, a total of ninety-four patents had been taken out on shaving mugs. Certain breweries pop to mind very quickly when talking about some of the best and/or up and coming American craft breweries. I think that Cigar City Brewing is past the point of up and coming: they are known by everyone. They have established themselves as a brewery that makes some solid beers with a few strange mixes and the desire to travel down the path less traveled (thank you Robert Frost). In spite of all this hysteria surrounding the brewery, I have been very slow to achieve the same happiness with their beers as most of their fans. One of the first beers I had by them was Winter Warmer Warmer Winter, if stated that right, and I didn’t even grade it on the site I was so disappointed in the beer. I followed that up with a Jai Alai IPA which was quite decent but then came along the humidor series of the same beer: Jai Alai Humidor Series. That beer did absolutely nothing for me, it actually made me decide that Cigar City was on the avoid list. I avoided them like the plague until I did Secret Santa and received some seven or more flavors of Cigar City beer. Yuck I believe was my first impression. I have slowly been conquering these beers and each one seems to be better than the last with Capricho Oscuro Batch #4, beer #113, being the best of the pack. My group of friends may still think of them on the negative side, but I am a convert and welcome the chance for any solid offering from Cigar City. Enjoy! Useless Fact: The first female monster to appear on the big screen was Bride of Frankenstein. American craft beer and a cold do not go too well together. Day two of my cold leaves me tired, head full of who knows what, a headache, and the inability to stay awake for more than a few hours at a time. I am exhausted. I knew I needed something to keep up, so I choose a stout that would have some big presence, hopefully able to knock through the cold. Marshal Zhukov’s Imperial Stout by Cigar City was just the beer that would fit the profile. If you have read this run of blogs at all, you know that Cigar City has been a brewery that I am not really fond of, having found more beers I dislike than like. Marshal Zhukov pours and looks superbly in my snifter. The aroma follows, having all the quality of a solid big stout. The taste has a bit of chocolate bitterness and burnt flavors that come on a little too strong, making it hard to drink. I can only imagine if I had more of my senses about me how much that combination might hinder my ability to like the beer even more. No matter, I would have it again, and I could really see myself trying it on tap. Enjoy! Useless Fact: The eight game pieces in Monopoly are: dog, top hat, wheel barrow, race car, boot, iron, battleship, thimble, and formerly used to also include the cannon, horse and rider and bag of money.